To this day I can’t explain why I skipped that one title in King’s oeuvre. His name on the cover alone was enough to draw me in. But perhaps it was the cover itself that put me off. Back in those days, the European covers—British, specifically—of King’s paperbacks tended to run from gruesomely effective to just plain silly. And if memory serves, the cover of Cujo was just an illustration of a drooling muzzle, which resembled a cross section of a corned beef sandwich. Or perhaps it was the movie adaptation, which despite winning performances by the actors (including the dog) and some effective moments, doesn’t hold a candle to the book. Usually if I see a movie before I’ve read the book, I don’t bother with the latter. The reverse, however, does not hold true. Whatever the reason, I was well into my thirties before I discovered a paperback copy of Cujo buried amid the old paperbacks in my closet. After perusing a forum in which people ranked their top ten favorite King books, and noting that Cujo featured on quite a lot of them, I decided to give it a go. Not only that, but I also rank it in my top ten favorite Stephen King novels. Admittedly, I went in expecting the tale of a killer dog, a rather simple (and in other hands, cheesy) premise that I knew would be elevated by King’s wonderfully comfortable voice, sense of place, and deftness of character. Cujo certainly benefits from all those things, and had I read this in my teens, that’s probably all I would have taken away from it. What I didn’t expect was a harrowing and bleak exploration of marital dissolution and the consequences of infidelity. The titular antagonist represents more than just a dog made homicidal by rabies, he is also a metaphor for the doom that descends on marriage when the love begins to wither, when deception comes easier than confession, when children begin to feel the death of truth and love among the only people they trust. Cujo is not just a crazed animal. He is consequence, an unstoppable exterior force that exposes weaknesses you were too selfish to see for yourself. He is nature, and nature cares little for the vagaries of marriage or the fallibility of man. It just takes what it wants. The sequences in which we get to see the dog’s confusion as it succumbs to the disease add a further element of sadness to an already grim tale. Whether or not you are, like me, a dog lover, it’s hard not to be affected by the poor animal’s helplessness as it goes from dumbly happy and loyal hound to a bloodthirsty killing machine driven mad by the slightest of sounds. And while Cujo goes mad, a marriage falls apart, a child begins to question the love of his parents, and the stage is set for arguably what is still one of King’s darkest endings to date (beaten, perhaps, only by Pet Sematary.) But however dark it is, it is also perfectly fitting, an ending which, had they kept it, would have made for a ballsier and much more impressive movie adaptation. I understand why Hollywood balked at including it, but it is, for me, what elevates the book from great to exceptional. It goes where it’s supposed to, where we hope it won’t. It’s a gut-punch you don’t see coming even though you probably should have. And that, to me, is the very definition of horror. Perhaps it helps that I read this after getting married and divorced. I saw things in the book my childhood self would not have seen. It added layers, sympathy, magnified the sadness and the horror. So to say Cujo is merely a tale of a dog gone nuts (an impression perpetuated by his frequent appearances in popular culture) is to do the book a great disservice. It’s a parable about marriage, human frailty, parenthood, and yes, evil, with nary a thread of the supernatural to be found. Because in Cujo, the dog is not the true monster at the heart of the story. Born and raised in Ireland, Kealan Patrick Burke is the Bram Stoker Award-winning author of six novels, over a hundred short stories, and editor of several acclaimed anthologies. When not writing, Kealan designs book covers through his company Elderlemon Design. A feature film based on his short story “Peekers” is currently in development at Lionsgate Entertainment. You can find him on the web at www.kealanpatrickburke.com, on Facebook, and on Twitter. It’s an interesting game of ‘What if?” to take this book – and Pet Sematary – and put them with King’s last book – Finders, Keepers. What if these 3 books were written in the same time period, how would have certain events played out in each of them? I take it you haven’t read _Revival_ then, huh? It’s not only King’s darkest ending, it’s the darkest ending of ANY book I’ve ever read. I think a lot of us come from the same place: we started reading King at an early age, and our memories/perceptions are of simple, scary monster tales. Then, as we reread them at a more mature age, we realize that there was much more going on. More reviews please, Mr. Burke! Succinct, sensitive and powerful. Thank you! I must read some of your fiction — now! That was very powerful. 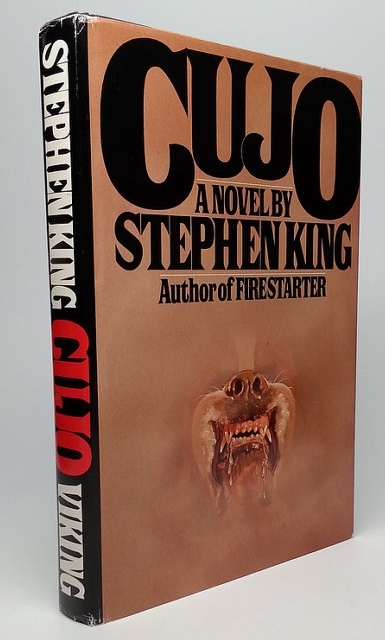 “Cujo” is right up there in my top 10 favorite King novels, too. And yes, it made me so sad that the dog had to die, and a marriage had to fall apart, and too, in the process the madness took others too. The horror of it all tore at my heart.